This entry was posted on October 4, 2012 by Dan Proud. It was filed under Insects and was tagged with animals, Boone, butterfly, caterpillar, Macro, macrophotography, nature. It’s nice having you back (and, as usual, great photos and lot of interesting information). hello i live morristown tn. i found one of these in my yard today. had never seen one until i researched it. was curious if they were posionious. Also, they are not considered pests, though I am not sure exactly what they eat (the host plant may differ between closely related species). Its a good thing to see them around the garden! Hope this helps. I found one that looks just like this in Southern Minnesota. Are they frequently found here? My class assumes they eat milkweed…what else do they eat? Yes, they could be found in Minnesota. Their range is basically the eastern US (east of the Rockies). I wasn’t sure about what they eat, but a quick search came up with some natural history information: http://www.windpuffindesigns.com/pdfs/tigerst.pdf. According to this resource the caterpillars will eat the leaves of various host plants, including: “willow, poplar, birch, American elm, red maple, black cherry, basswood, magnolia, apple, and tulip trees”. Adults will certainly visit milkweed flowers for nectar. I’m not sure if caterpillars eat the milkweed leaves (though it is possible!). I’m glad to see that you out searching for info on exciting stuff your class has found!! I assume that means you are a teacher! Keep up the good work! Yes indeed, we have 421 kindergartners at our school with about 100% of them excited about this caterpillar. Each class has asked to look at it, and it’s easily the first thing my students want to talk about each morning. The caterpillar is resting comfortably in his chrysalis as we speak. It helped a little girl calm down when she was crying yesterday as she missed her mom so very badly. Nature is truly a wonderful thing with such great power! We’ll keep you posted on our amazing friend. My class wants to know what to feed him when he comes out? 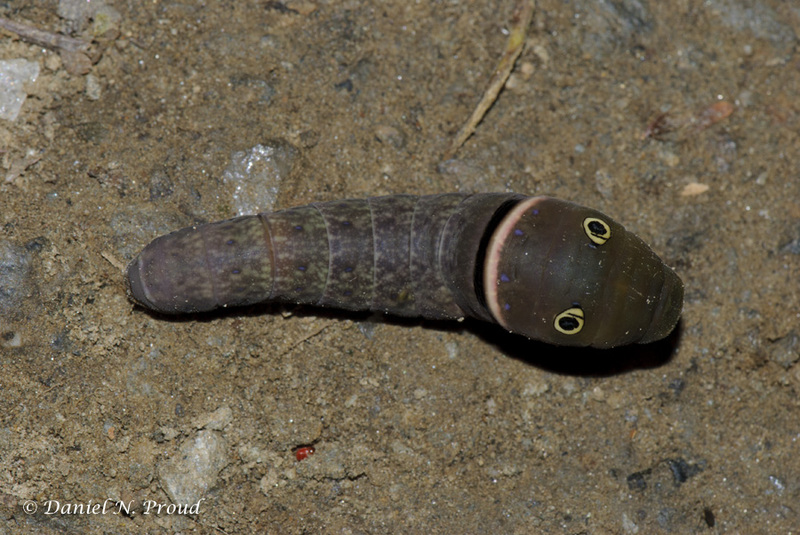 Being this late in the fall, the animal would likely overwinter at this pupal stage (the chrysalis). But I’m not sure what cues are used for entering hibernation (environmental?). So if you are keeping it indoors it may complete its final molt. If the adult does emerge, my suggestion would be to provide any kind of flowering plant that is around right now. If it hibernates as a chrysalis then you will have something for the kids to enjoy all winter long! I’m not sure how long lived the adults are either. Thanks for sharing the story about how this animal has helped out your kindergartners! I’m glad to hear that they find nature and science so fascinating at such a young age!! Dan doesn’t know any REAL lepidopterists, so I’ll have to stand in for one 🙂 . 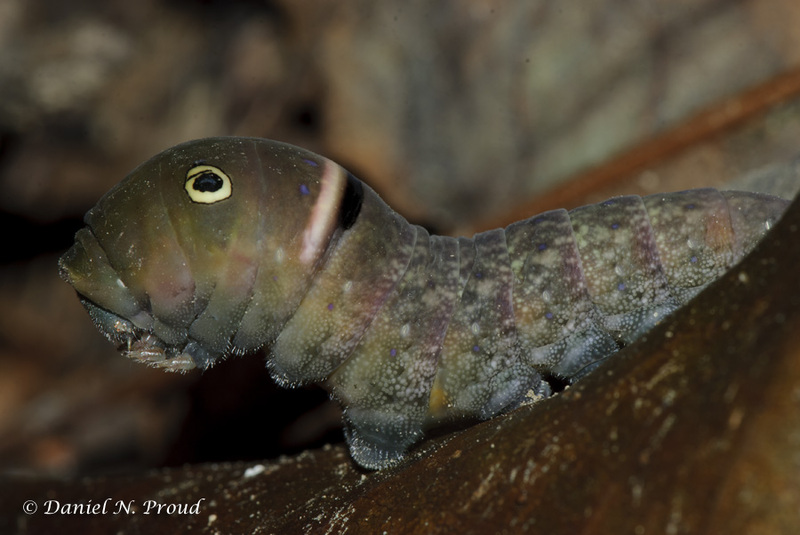 According to the very useful Bugguide website for this species (http://bugguide.net/node/view/491), “Caterpillars feed on Sweet Bay (Magnolia virginiana), Black Cherry (Prunus serotina), Swamp Bay(Persea palustris) and Tuliptree (Liriodendron tulipifera). Adults take nectar from a variety of flowers.” The individual in Dan’s photos looks ready to pupate, since it has started to turn darker (they’re typically green). If your class’s bug is turning brown or purple like this and wandering around the container, then yours is ready as well. It will stop eating (this freaks kids out) and will want some structure to crawl up and pupate on, like maybe a cut branch if your container is large enough to accommodate one. 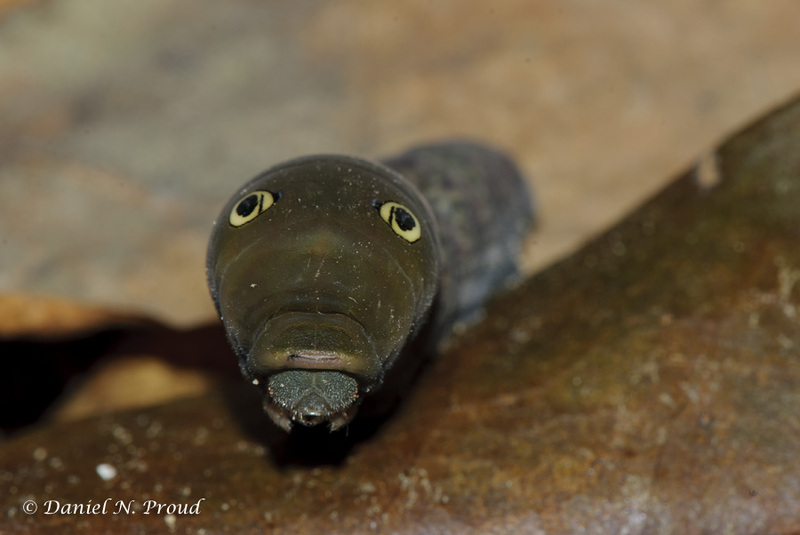 I think that adults probably use temperature and light cues for when to emerge from pupation (the chrysalis). If you keep it warm in the classroom, it may emerge at an inopportune time to be an adult who drinks nectar (like January). If that’s the case, let us know and we can help you rig up a nectaring station. Otherwise, kids love letting butterflies (and moths) go when they emerge in the spring or summer. If you go this route, the adult will come out and need several hours to inflate and harden its wings, so don’t try to get it to fly right away. If constrained in a small container it may keep trying to fly until it messes up its wings pretty bad (I’m not sure, since I don’t have experience with this species in captivity). Enjoy! Yeah they are quite common in the eastern US. Thanks for sharing your observation! I just found one in Victoria, BC, Canada. That’s about as west as you can get in North America. Perhaps I am mistaken in identification? It is a greyish brown with tiny blue specks, as well as a black and white line and eye spots. Is it possible that it emits a fruity smell? Or perhaps it just from the cup I placed it in? I looked around for some info on other species of the Tiger Swallowtail, and it appears that in Victoria you may have one or two related species – either Papilio canadensis or Papilio rutulus. Wikipedia has a lot of information available on these popular species – I am linking two pages below. Both species distributions could possibly overlap near Vancouver Island. As for the fruity smell – it is possible, but I don’t know a whole lot about that aspect of their biology. 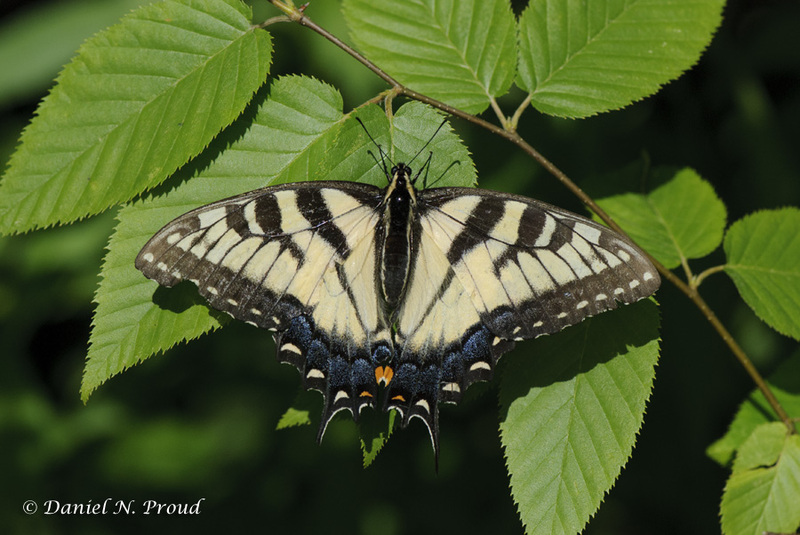 The defense secretion of the Eastern Tiger Swallowtail (P. glaucus) is usually described as foul-smelling. However, based on my experience working with Opiliones (daddy long legs), the smell of the volatile defense secretions that they emit can vary greatly between related species. So perhaps in one of the two western species the smell is perceived as more fruity! Great observation! Thanks for sharing! That’s unfortunate 😦 …but next time you can observe and enjoy, knowing what it is and that it is harmless! I found one of these, in September. At first I though it was cute. It sat up on its rear end like a dog. Then it stuck it’s fork looking tough out, & that scared the hell out of me. ( no longer cute ). I have never seen one of these, until I researched it. Didn’t know they came to Northern MN. How would one have gotten all of the way to Northern California? My friend found one at her workplace in the foothills to the Sierras. I believe that there is a species in the west that looks similar.